NO To NEW TRIDENT - For LOVE & For LIFE: Gadzooks - "Vintage" Nukes on New Tridents!!! Gadzooks - "Vintage" Nukes on New Tridents!!! The US Naval Institute has done just what one would expect such an organization to do - raise the alarm over the "vintage" nuclear missiles (Trident II D-5) that will be initially deployed on the Navy's replacement ballistic missile submarines. The institute's concern is that sooner (and not later) the Navy will need a new missile, and NOW is the time to get to work on it. The obvious question, which NO ONE seems to be asking, is of what value is the Trident nuclear weapons system (OHIO class submarines with their Trident submarine-launched ballistic missiles) in today's world. The Cold War is long over and the Trident weapons system, which was designed specifically to render the (then) Soviet Union a radioactive wasteland, is a true relic of a bygone era. Would we really launch massive thermonuclear weapons (Trident II D-5s) against North Korea or Iran, considering the fact that the resulting radioactive fallout would affect adjacent countries. Have we forgotten that the effects of nuclear weapons, once detonated, are uncontrollable, and that there is no practical way to clean up such a mess??? The final paragraph in the USNI article is laughable and misleading (using the words "current experience:). In the context of that coupled with the rest of the article one might think that the US nuclear weapons complex was that of a developing nation, and that the technological wizards in North Korea are "currently" whizzing past us. So long as the US stays fixated on the doctrine of nuclear deterrence, we remain locked in a deadly paradox. So long as the US (and Russia) continue to re-invigorate their nuclear forces, the rest of the world (North Korea, Iran...) will follow. The results will likely not by pretty. At any rate, with 143 consecutive successful test flights of the Trident II D-5 missile (under operational conditions) since 1989 (a perfect record!!! ), it's hard to think of it as any remotely resembling "vintage." 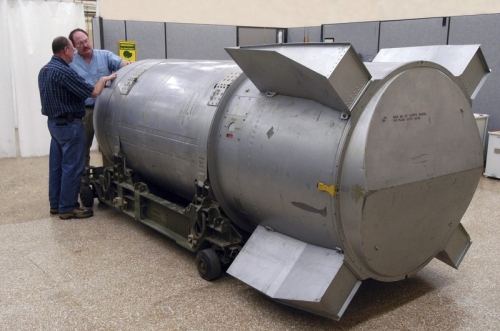 Note to USNI: THIS is what a "vintage" nuclear weapon looks like. Read the article for yourself, and see what you think of the author's argument. When the U.S. Navy’s new SSBN (X) conducts its first patrol in 2031 it will be an entirely new vessel, but the boat will initially rely on life-extended 1990s vintage Trident II D5 submarine-launched ballistic missiles (SLBMs) to perform its nuclear deterrence mission. The Navy currently expects to keep the D5 in service into the 2040s, after which it may replace the long-serving weapon with a new missile. Though the United States is upgrading existing missiles and taking steps to keep its existing warheads viable, there is no work being done to develop a new intercontinental ballistic missile (ICBM) or SLBM for the time being. The Navy is deferring equipping the new SSBN(X) with a new missile because of the sheer cost of developing and fielding such a system during fiscally lean times. But moreover, there is no immediate military need to do so because the Trident will remain viable for sometime to come. However, the U.S. Strategic Command is conducting an analysis of alternatives for the future. But there are questions as to how viable the U.S. missile industrial base will be when the time comes to develop a new missile later this century. Russia, since the collapse of the Soviet Union, has faced numerous difficulties with developing new ICBMs and SLBMs. The Bulava SLBM, for example, had numerous problems, failing six of 13 launch attempts before 2009. However, after a difficult period of troubleshooting, the Bulava program now appears to be on track, with seven successful missile launches since October 2010. “Why would we be any different if we don’t maintain the experience base in making these things?” asks Dan Goure, an analyst at the Lexington Institute. NASA, for example, is essentially starting over in developing manned space-flight capability to a certain extent because those skill sets have atrophied, Goure said. “We can hope—only hope—that the work being done for Trident and United Launch Alliance and the Evolved Expendable Launch Vehicle (EELV) and work being done for NASA will maintain enough of a cadre so that we can in fact design a new ICBM,” he said. There is no question that America needs to invest in keeping its nuclear deterrent credible, said Peter Huessy, an expert on nuclear weapons at GeoStrategic Analysis. In his view, however, the missile industrial base is less of a concern than retaining the ability to develop an actual nuclear warhead, he said. Huessy and Barry Watts at the Center for Strategic and Budgetary Assessments say that programs like the EELV or refurbishment programs for existing missiles are probably sufficient to keep ICBM and SLBM design skills alive. Huessy said that there are many components on the U.S. Air Force Minuteman III, for example, that are being replaced—which requires many of the skills needed to design an entirely new weapon. “They have all sorts of ideas on how to build a Minuteman [replacement],” he said. But while the United States continues to upgrade existing missiles, other nations continue to develop and field nuclear weapons and the launch vehicles to deliver them. Russia continues to modernize its arsenal with new Topol-M ICBMs, new Bulava SLBMs, and reportedly another new heavy ICBM that is under development. So too, is China modernizing its nuclear forces, Huessy said. “[Assistant Defense Secretary Madelyn Creeden, in her April 17 testimony before the Senate Armed Services Committee] also concluded China is building advanced solid fueled rockets, a new type 094 Jin-class submarine along with its new JL-2 missile,” he said. But the real problem might be far more serious than whether the United States will be able to build a new ballistic missile. There are doubts as to whether the nation will be able to retain the talent to build a new nuclear weapon in the future. “We’re as a matter of policy leaning in the direction of exiting the nuclear business,” Watts said. The leftover warheads from end of the Cold War were approaching limits of what could be achieved for yield, Watts said, and were only designed for a lifespan of about 10 years. Now the weapons are approaching an average age of about quarter of century. Though the U.S. nuclear stockpile most likely works, at the end the day, without a full-scale test, it is not known if the weapons would actually detonate properly, Huessy said. Essentially, without testing, the United States is hoping computer models are robust enough to make sure the devices work. The labs look for deteriorated parts and replace those. Ultimately though, “We’re guessing that they work,” Huessy said. The United States could resolves some of those issues by bringing forward low-level design programs for ballistic missiles, Goure said. For a ballistic-missile program, the military would have to consider whether the Minuteman and Trident could be replaced with a common weapon, he said. However, given the size restrictions on board a submarine, a naval weapon would have to be adapted for land-based use—otherwise, it simply would not work. ICBMs are much larger than the typical SLBM and would not fit into the 87-inch tubes of either the Ohio or SSBN(X) classes of submarines, Goure said. As for maintaining the nuclear-weapons complex, U.S. policy would have to fundamentally change. Watts said that if the assumption is that nuclear weapons are “going away,” then investing in new designs is a waste. President Barack Obama’s administration adheres to a vision of a “global zero” for nuclear weapons, but has pledged to maintain a credible deterrent. However, as the nation’s ability to design and build such weapons atrophies, so does that deterrent—and as Watts points out, the number nuclear-weapon states is increasing rather than decreasing.